EABASSOC SBS and APP Torching Membranes are high performance torch-on waterproofing membranes based on SBS rubber and APP plastomer modified bitumen respectively, reinforced with a spunbonded polyester. Standard Grade which are good quality, low cost membranes, and Superior Grade which are made to a very high standard, to ensure outstanding elongation and cold flex resistance properties. EABASSOC SBS and APP Membranes can be applied in the waterproofing of flat or pitched roofs, either as a single layer system or as a top layer in a built up roof. They are compatible with a wide array of deckings, roofings and insulation products. They can, therefore, be applied both in new construction and in renewal work. EABASSOC Torching Membranes are very strong. They resist stresses due to building movement and withstand rough handling during transportation, application and subsequent foot traffic. They have excellent resistance to many chemical agents, humidity and micro-organisms, although they are not resistant to hydrocarbons such as solvents and gasoline. They are guaranteed for 10 years, but will normally last much longer. Both grades of APP and SBS are available in a sanded or a mineral finish. Roofs waterproofed with EABASSOC Torching Membranes are virtually maintenance free, with only general appearance inspections necessary. Superior Grade in a red mineral finish. Superior Grade in a sanded finish. EABASSOC SBS Torching Membranes are reinforced with a nonwoven, polyester fleece. They are particularly suitable for use in "extreme" conditions, either in very hot or very cold climates or on superlight structures where a high degree of movement is expected. They are very strong and can withstand rough handling and subsequent foot traffic. This makes them ideal for roofs where regular traffic would put the waterproofing membrane under continuous risk of damage. They are designed to accommodate expansion and contraction of the roof without visible distortion or crinkling. The high flexibility means that they hug the roof surface contours, reducing the risk of air entrapment and can withstand flexing of lightweight roofs without cracking, even at very low temperatures. 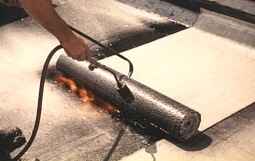 EABASSOC SBS Torching Membranes are easily applied, either by the traditional pour and roll technique, or with cold adhesives, but especially by the flame torching method. EABASSOC APP Torching Membranes are reinforced with a nonwoven, polyester fleece. They are particularly suitable for use in "extreme" conditions, and are specifically suited to very hot climates and on roof decks where a lot of detailing work is to be done. By using special types of APP which remain flexible even at very low temperatures, EABASSOC APP Torching Membranes follow the thermal movement of roofs without cracking, even at temperatures below freezing. Therefore, even after torching, which hardens the membrane, it outperforms competitive membranes which have not been torched.